This concrete sand paver project we installed the outside parameter concrete base and mortar set the ribbon so it would never unlock . Snap edge works good but this is the best way to lock in the pavers where deep base materials are used to bring up to grade. 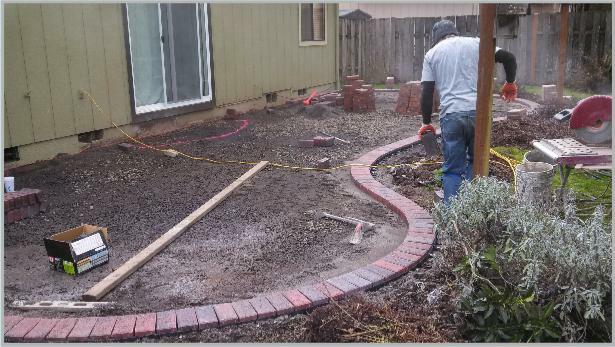 We install a geo mat to help stabalize the rock base and compacted it then installed a sand base for the brick and sanded the concrete pavers using a standard paver sand on this project. Portland Masonry at its finest ! Brick masonry repair & concrete surface repair. Custom patios with combinations of brick and stone and landscape masonry. Randy McKee Masonry will help design your projects or provide professional designers that will fit your needs for the project you have in mind. We work with homeowners , spec home builders on new and remodel masonry construction. We are a Brick, Stone, Concrete and hardscape contractor. Please give us a call or fill out our web contact form for your free estimate today. Here we installed a concrete parameter containment wall to lock in the architectural slabs. 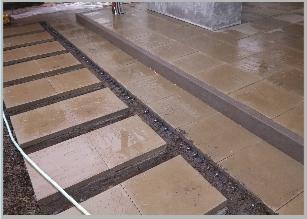 The slabs were installed over crushed stone and sand base . We then installed the architectural slabs around outside edge of patio at far end and from new patio area to existing patio over poured concrete slabs . We mortared the architectural slabs to the base concrete to secure them from moving. Using a snap edge on the side by side slabs may have eventually gave way for movement . 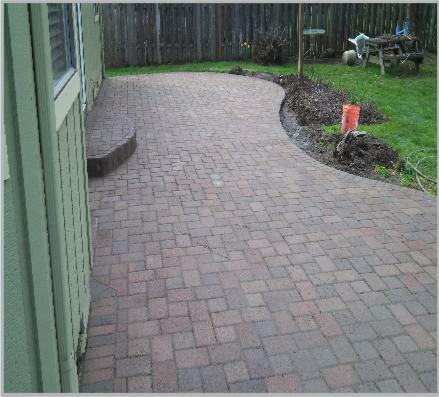 Do your paver patio during the winter and save...call 503-554-9510, or send us our easy web form for same day contact. 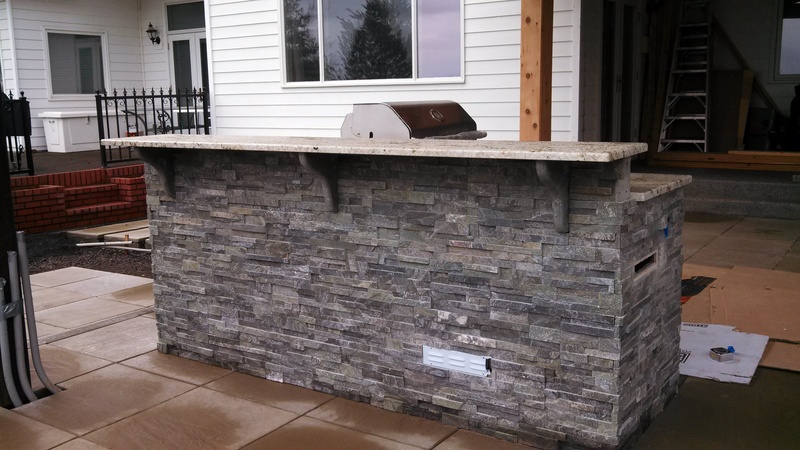 The Bbq island stone veneer was Rox pro stone from Mutual materials , we also hand made the stone bracing for the marble bar to set counter on from variegated bluestone . Alpine Jade - Limestone with moderately variable deep green and gray hues. Weathered surfaces in the Ledgestone introduce some brown and tan highlights. Alpine Jade is particularly suited to rainy climates, where the richest hues are richer when wet. We now service Portland, Clackamus, Tigard , West linn, Oregon city, Wilsonville, Salem, Corvalis,Albany,lincoln city, Eugene, Springfiled Hillsboro,Newberg, Mcminville, Canby, Gresham, Banks,Forrest grove, all of washington county, Yamhill county, Marion county, clackamus county . 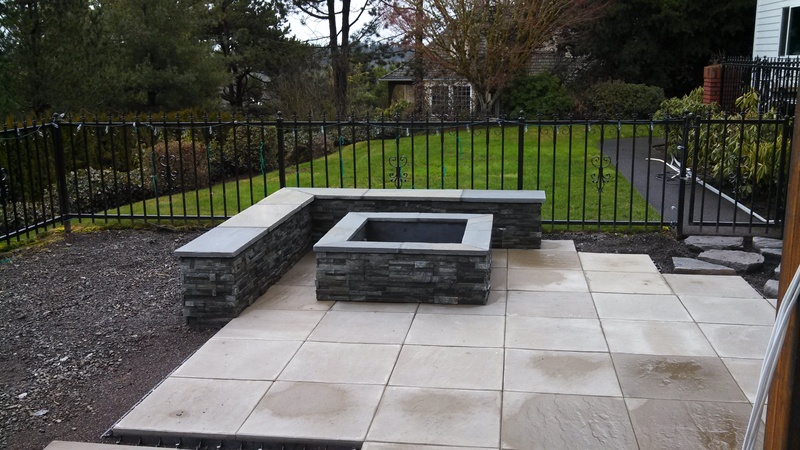 We Built the firepit and seating using real stone from Rox stone using variegated Bluestone seat and cap for firepit with flamed edge . web page by Randy M.
CALL ANYTIME ! 503-554-9510 OR QUICK WEB FORM WE WILL RESPOND THE SAME DAY..EVEN ON THE WEEKENDS ! 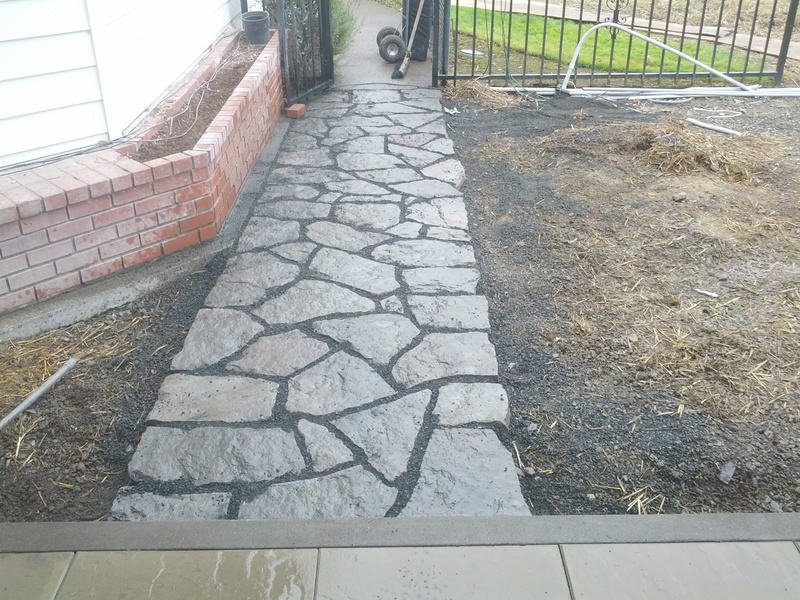 We installed the basalt walkway off the patio to existing walkway around home . 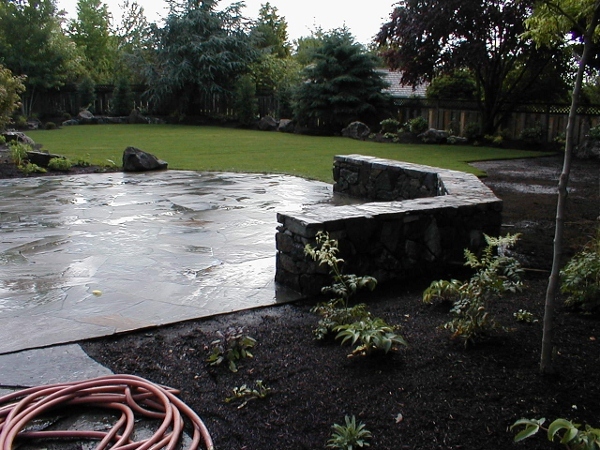 We install all types of Hardscape including boulders that integrate into your project, give us a call at 503 554 9510 and set up an appointment for a free estimate of your project. Or send us a webform for same day contact and bid day setup. 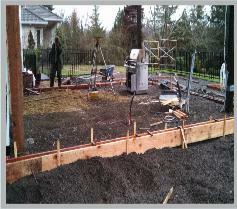 Here we set up and poured the perimeter of the patio wall in concrete with a sand etched surface. 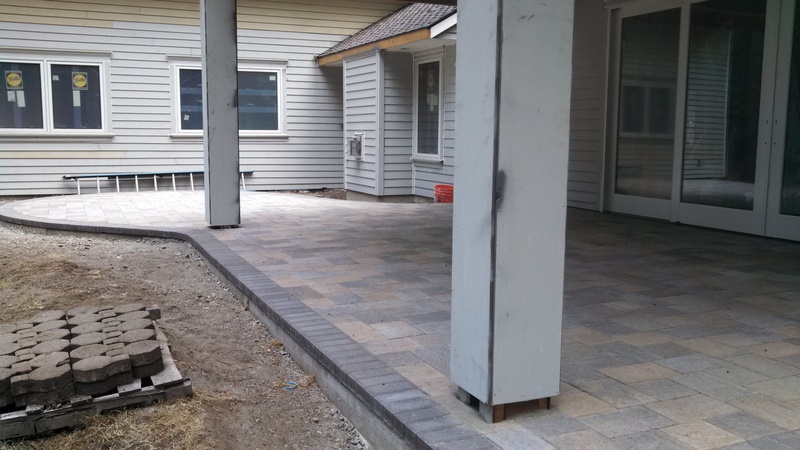 We install all hardscape interlocking paver systems, We use western interlock paver,Pavestone pavers, Belgard paver and wall products,Mutual material pavers and segmental wall products. We Use state of the art paver software to help design your paver patios and walkways Or even parking lots. We can Install it all. 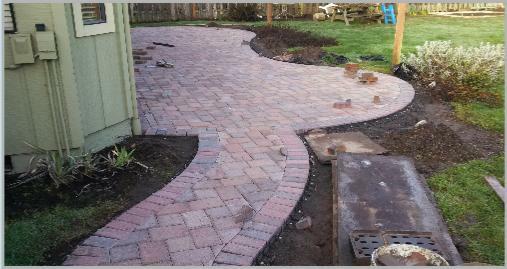 We install all interlocking paver products from Portland to Salem and clackamas to Mcminnville. Give us a call at 503 554-9510 anytime. even on the weekends. The customer had a Wood deck removed to have this new concrete paver patio installed using western interlock pavers, With the use of interlocking pavers Vs. wood is by far the best way to provide much longer lasting product for the money , with wood costs so high you will save from every haven't worry for rot or oil staining that deck every year or two. 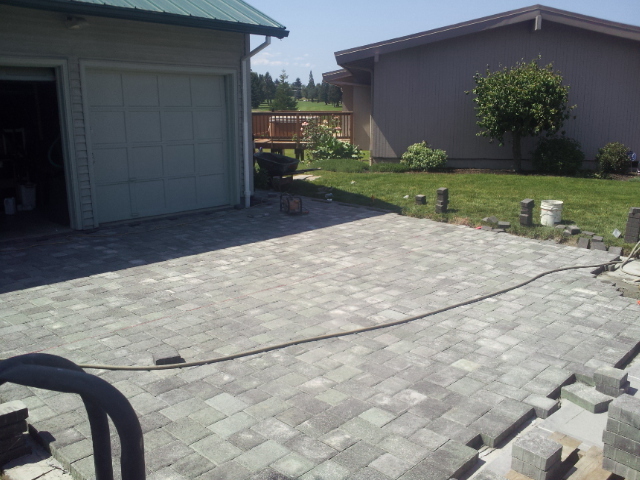 the upkeep of a paver patio is minor in comparison, It is the mid range cost of patios from concrete to stone patios . 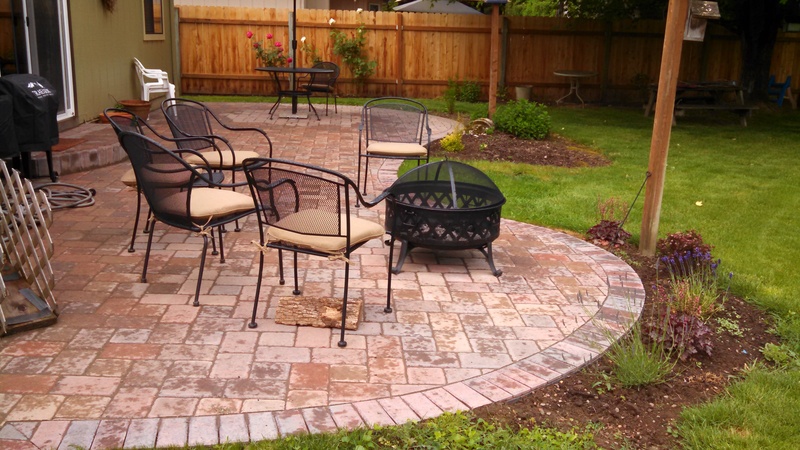 Oregonbrick masonry Installs all types and designs of concrete interlocking paver patios in Portland to Salem and from Gresham to McMinville. 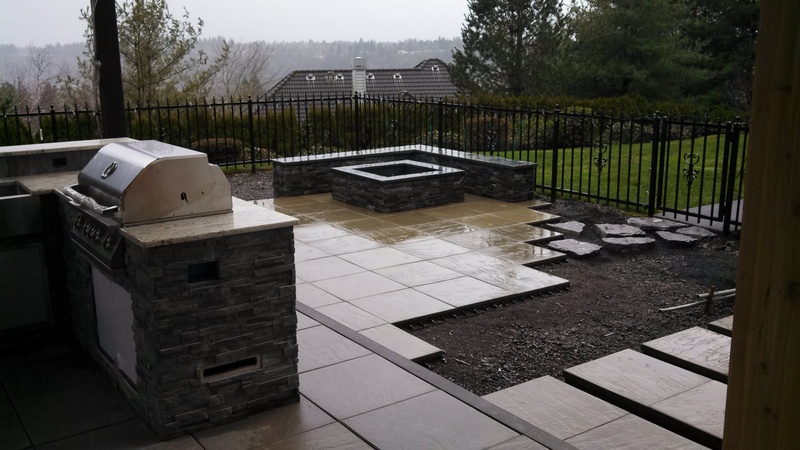 Oregonbrick inc. masonry Installs all types of Hardscape products, from the interlocking sand pavers to Hardscape of boulder stone integrated into the patio or walls or dry stack block wall systems oand standard block to clay brick walls and patios. 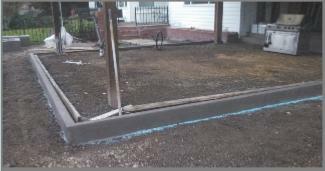 Here we removed the old concrete driveway and installed a concrete base and new driveway apron . 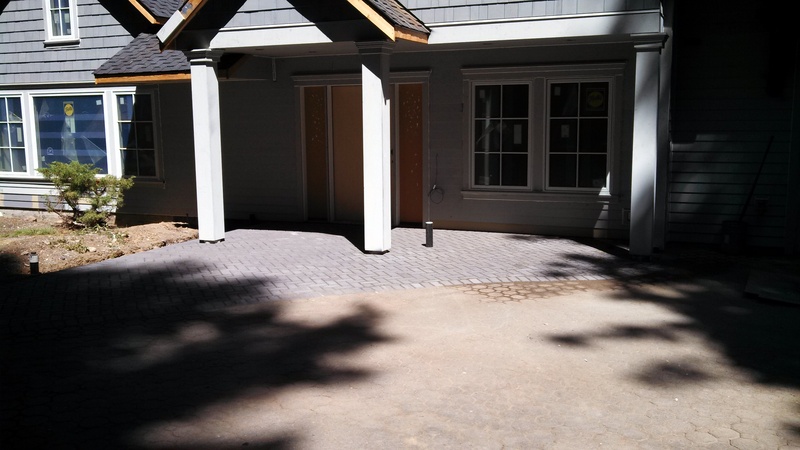 We installed a ribbon on the edges and a muster k pattern in filed area in this concrete paver driveway with sanded joints. 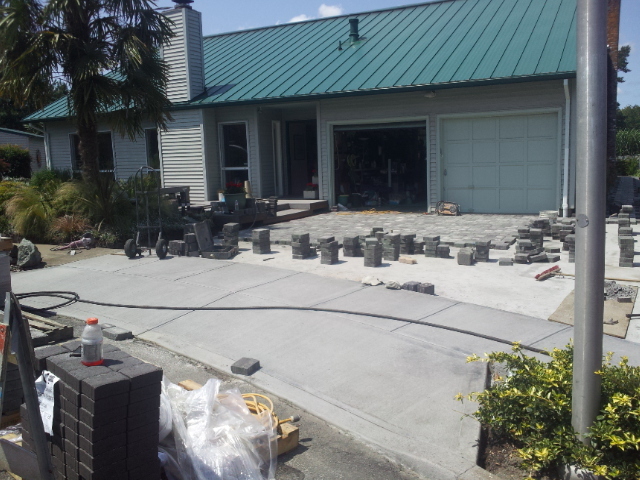 The customer wanted the best base that would last a lifetime and with concrete it will. we slopped the driveway to the street as water would still need to run off on this type of base. We can also install drainage under this type of base if wanted but keep the strength of the concrete base for the concrete paver. 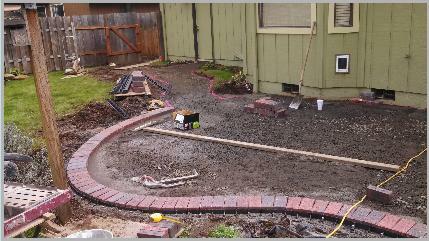 Concrete paver driveways allow for many designs. this one was a very basic design , we can add circles and combine them , or add patterns of any design you may want.